Performers include: Mark Duplass, Nick Kroll, Jon Lajoie, Stephen Rannazzisi, Paul Scheer, Katie Aselton, Leslie Bibb, Nadine Velazquez, Alina Foley, and Janina Gavankar. 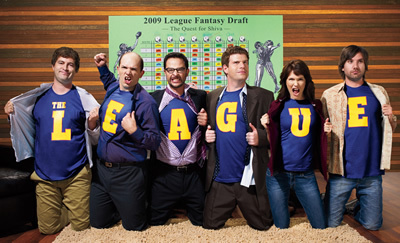 This semi-scripted TV show focuses on a fantasy football league, yet is mostly about friendship, marriage, parenting, and growing up (or the refusal to do so). The competitors in the fantasy football league rely on deception and trickery, and focus on winning at all costs. Somehow this all doubles back around to affect their personal relationships both at home and at work. Pete Eckhart (Mark Duplass) talks his way out of almost everything he gets himself into, and has been forced into becoming an adult. He doesn’t enjoy his work and doesn’t get along with his wife Meegan (Leslie Bibb) very well, but on the fantasy football field he’s a hero. He wins more than he loses and loves to rub it in. Pete’s best friend is Kevin (Stephen Rannazzisi), the League Commissioner. He was the first of all the guys to get married and start a family. He started the league for fun, but it only seemed to increase the amount of children he had to take care of. His wife, Jenny (Katie Aselton), holds her own with the guys, and many think she’s the brains behind the outfit. She’s caught between extending their family and partying. Ruxin (Nick Kroll) is constantly in conflict with himself. Despite his arrogance and education, he has never won the league and believes it’s because everyone is against him. He and his wife, Sophia (Nadine Velazquez), are new parents and have put their baby up on a pedestal. No one really knows how Taco (Jon Lajoie) gets by, and even his own brother, Kevin, thinks his gameplay is the only way to tell he’s alive. He doesn’t put near the amount of time into planning his fantasy football team as the others do, yet does very well with his picks. He’s the only one that has won other than Pete, yet was in Thailand at the time. Andre (Paul Scheer) is a rich plastic surgeon, yet is the one everyone makes fun of. They still make fun of him for picking Marshall Faulk the year after he retired. Who will win the Shiva? Who will win the Sacko? Will Kevin or Jenny win The Snip? Ruxin has a big decision to make that will affect not only his chances of winning but whether the league will even survive. What do you think? Do you like The League TV show? Do you think it should have ended or been renewed for an eighth season?